Don Bosco recognised Michael Magone's natural leadership talent as soon as he saw him playing with a gang of other youngsters near the railway station in the Italian town of Carmagnola in 1857. He offered the boy the chance to study with him in Turin, and Michael's subsequent spiritual and personal development led Don Bosco to recognise a saint in the making. The remainder of his short life was lived in love for God and for others. 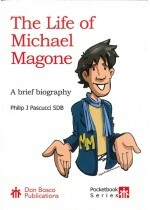 This short biography was written by Philip J Pascucci SDB, and was inspired by Don Bosco's Biographies of Students Michael Magone and Francis Besucco, and by a lost book by Fr Peter Lappin SDB, entitled General Mickey. The cover illustration is by Agustín de la Torre. The shipping is included in the cost of this book.